This is an extremely valid point. Non-rental buildings units still sell, but at a substantial discount to rental allowed buildings. I'll agree to disagree on the renters vs. owners debate but can tell you it is harder than you think to get rid of a bad tenant. My buddy is on strata at Promontory and *****es constantly about the renters and the issues they've had with SOME not ALL. As of recent Bayview had a terrible renter that took a while to get rid of and the building is now back to normal (key scratching the fob readers, damage to party room) it took a while to figure who it was and ousted him but wasn't quick and wasn't easy. As an owner I find it hard to believe anyone spending over $400k on a unit is going to devalue the property. Again just my opinion. A couple of units have moved into the tower, one on the fifth floor. A move-in is in progress this morning. Edited by laconic, 02 February 2019 - 09:03 AM. Anyone know if these are common or private? They sure don't look level! Edit: As has been pointed out to me, the garage floor slopes so each plugin is the same height from the ground. Makes sense just looks odd in the photo. Why should they be level? Some people are very short, some people are very tall. Get over it, man. According to marketing marterial which may differ from the finished product. If CoV was smart they would have secured the provision of EV charging through the rezoning, or through the zoning bylaw. That's what we've done in Richmond: 100% of new residential parking stalls must be EV ready (i.e. the outlet is there but not necessarily the charger), Removes the guessing game. Came across this rental ad for a furnished condo in Encore. The ad claims Encore is completely smoke-free. Can anyone who owns there confirm this? BOSA made promises for Promontory about having every stall electric vehicle capable. Only the 10 stalls mentioned in the article have conduit (largely because they are immediately below the electrical vault). There isn't any pre-wiring for any of the other stalls, other than the upgraded transformer. They wanted to charge about $6000 for a charging stall and it turned out nobody took them up on the offer. BOSA allocated the pre-wired stalls to regular folks. The problem with that is that once the stalls have been assigned they can't easily be reassigned (in effect they are limited common property permanently assigned to a particular unit). In addition, because of their scarcity they are now an asset. Having a charger in your own stall is definitely a luxury and very convenient. A level 2 charger can take 4-5 hours to charge an almost empty EV, so it can be a pain if you have to move your car when done charging. There isn't really a need to have a charger in every stall. With a decent cord, a single charger can be shared among three or four stalls. 1) Have a set of designated charging stalls available. 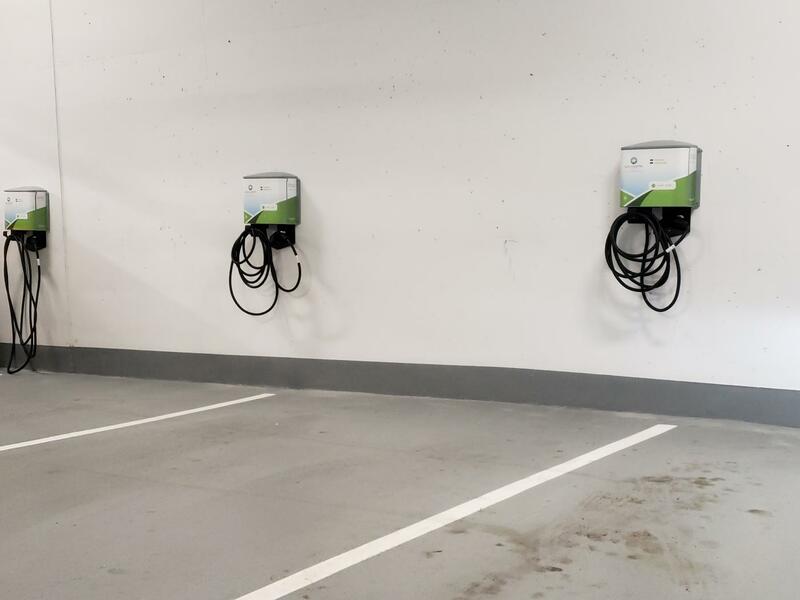 Until the chargers are installed the spots can be occupied by a particular owner, but once there is a need to put a charger in the stall then that person must swap stalls for a non-charging stall. 2) Have an overflow area right next to the charging stations. This allows charged cars to be conveniently moved if there is lots of demand for the charging stalls. Play the same designation game to be able to expand the overflow area. 3) Ensure that the charging stations have wireless capability. This allow the charging station to report if it is in use (and to identify/shame those folks who continue to hog a stall after they are done charging). interesting. yes a change to the limited common property requires a 100% vote. then it has to be registered again at land titles. so a virtual impossibility to have it changed. Would be nice. But I don't know for sure. On the other hand, I haven't smelt any tobacco smoke in the building at all. I'd actually forgotten smoking exists. The majority of new buildings are, no? An interesting point of note is that I saw that construction workers on the Encore development had to go to the sidewalk on the other side of the street to smoke on their breaks. Therefore, it may be true that the building and grounds are smoke free. Even older buildings are adopting no smoking bylaws, even on your own deck or inside your unit. Yup, the Bayview One strata recently voted for the property to become completely smoke-free. No smoking anywhere on the property. It further prohibits growing, selling, or smoking marijuana anywhere on the property. Edited by Gary H, 28 February 2019 - 09:54 AM. ^Keeping people from their medicine? Say it ain't so. Can we chalk this up to completed, or are remnants still under construction? There are still a few workers on site, but it looks substantially complete. Perhaps they are fixing deficiencies, I'd think it's safe to move this to the completed section.